Legal permanent residents, also known as green card holders, have the same rights inside of the United States as citizens do. Therefore, the right of interstate travel is also awarded to green card holders. Green card holders may only experience travel trouble while traveling internationally. Permanent residents must adhere to the time limits of overseas travel. However, in the case of Guam, overseas restrictions do not apply. Guam is a United States Territory, which means that though it is not one of the 50 states, its citizens vote in U.S. national elections and elect one non-voting representative to the U.S. House of Representatives. Guam is protected by U.S. sovereignty, and with all definition aside, is virtually an extended part of the United States by nature of the term "territory." As such, Americans do not need passports to visit or stay in Guam for extended periods of time. Legal permanent residents (LPRs) have the same legal rights for traveling inside of the U.S. as citizens do. As U.S. citizens don't need visas or passports to travel to Guam, neither do LPRs (green card holders). An LPR can travel to Guam just as he/she can travel to New York, Miami, Chicago, Seattle or LA, there are no restrictions nor needed extra documents. All that is needed is a form of identification to match to the boarding pass before entering the plane. Though a passport is not needed for an LPR to ravel to Guam, it is always a good idea to keep it on you when traveling far from home. Guam is located in the Southwest Pacific in Micronesia---which is not particularly close the U.S. mainland. If the case of emergency, or necessary travel outside of Guam, it is beneficial to have your passport with you. This goes for U.S. citizens as well. While in Guam you can still use your U.S. driver's license to drive. An international driver's permit is not needed if you have a U.S. driver's license. If you are planning to do any other travel outside of Guam while in Micronesia, you will need to have your national passport as well as a visa in some cases. Make sure to plan your itinerary ahead of time to make any necessary applications. LPRs do not need a visa to visit Mexico or Canada even if they are of a nationality that is required to obtain one. For all other countries, if your country of citizenship is required to obtain a visa for a specific country, then you must acquire one before entering. Ferland, Mallory. "US Green Card & Travel to Guam." 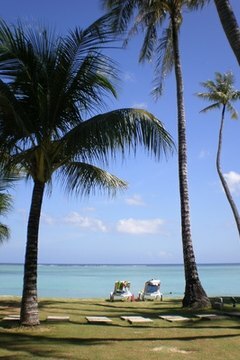 , https://legalbeagle.com/6399479-green-card-travel-guam.html. Accessed 20 April 2019.